THE mass demonstrations that continue to rock the Middle East are not just a threat to the region’s entrenched despots — they represent an unravelling of the American imperium no less. Some long-held assumptions about the political inclinations of Arab citizens are also being challenged. Over the last 60 years, the United States and its Western allies progressively advanced their dominion over much of the Middle East by deposing unfriendly or uncooperative regimes and propping up friendly governments through political and military alliances. What evolved was a system of local satraps who were deeply unpopular with their own people but supportive of America’s broader regional objectives — control over the region’s oil wealth, protecting Israel’s security and containing radical Islam. Lost in the midst of this grand strategy were both the interests of the people themselves and the very principles of democracy that once earned America admiration and respect in the developing world. The grand failure of American diplomacy was that it never found a way to reconcile its own strategic interests in the region with the hopes and aspirations of Arab citizens. Particularly after Islamists won elections first in Algeria and then in Gaza, it chose to put its faith in a few ruthless dictators instead of genuinely working to empower civil society and developing strong national institutions. It was a case of security and stability trumping democracy and development. Many, both local and foreign, warned that such a strategy was unsustainable but hubris overwhelmed wisdom, especially during the Bush years. 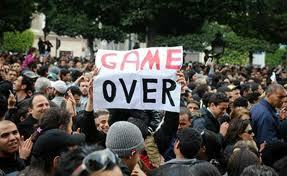 Now that the day of reckoning has arrived, Western governments are rushing to find common cause with the Arab street. France, Switzerland and Italy, for example, quickly closed their doors to deposed Tunisian dictator Ben Ali and his family and froze their assets. Canada is presently seeking to evict Ben Ali’s family members though it was happy to give them permanent residence when they ruled Tunisia. As the shouts for “hurriyya” or liberty grew louder on the streets of Egypt, Western capitals gushed with sudden admiration for its citizens. US Secretary of State Hillary Clinton unabashedly said that America had been on the side of Egyptians for the past 30 years! How hollow and shallow all this must sound to Arab citizens. They may be poor and oppressed but they are not stupid. They know who stood with their oppressors all these years. They know it’s easy to kick a despot when he’s down but it takes real conviction to stand up to one when he’s at the height of his power. On the contrary, Arab citizens appear to be generally looking to the West for support and sympathy. What they want is not more pious platitudes but unequivocal support, pressure on the security forces not to resort to violence and a firm commitment to real and meaningful democratic change. Of course, there is always the possibility that Islamic radicals might come out of the shadows and seize power as they did in Iran after the Shah was toppled. Iran’s mullahs are certainly wishing for this, forgetting that there is a restlessness for change on their own streets, as witnessed last year following flawed presidential elections there. The last thing the Arab world needs, after decades of oppression by secular despots, is yet more oppression by religious zealots. They need to move forward into modernity, not backward into past mirages. But this is something that Arab citizens themselves will have to grapple with. The sooner strong democratic institutions — a free press, an impartial judiciary, a transparent, accountable and responsive governance system — are established, the better they will be able to resist both forms of tyranny. For now, it must certainly speak volumes about their politics that the cry for what the American Declaration of Independence so eloquently called “life, liberty and the pursuit of happiness” united, galvanised and energised the Arab street to a degree that Osama bin Laden and his ilk can only envy. Change has come not in response to Obama or Osama but in response to their own yearning for freedom and dignity. America and the West must now support an orderly transition by taking a clear stand. Once Arab citizens are convinced that the West is committed to genuine change, they are more likely to be trusting, for example, of an interim administration in Egypt, pending free and fair elections. What is also urgently needed is a bold and visionary development agenda, a new Marshall Plan even, that will help transform the Middle East into a dynamic region of growth and prosperity. It is the only way to ensure lasting stability in this important region. It will be a lot cheaper than another war. Whatever happens, Arab citizens now see themselves differently. They are sending a clear message that they will not allow Western priorities to take precedence over their own hopes and aspirations for a better future. They are marching to the beat of their own drums and there is no going back to the days of the American imperium.